The danger of a continued Trump presidency is too dire to spend our limited resources on internal fights. This November, the day before the midterm election, I spoke with a retired police officer in Staten Island, New York, who’d voted for Trump. Let’s call him Tom. Tom didn’t regret voting for Trump. He was a Republican-leaning swing voter. Most progressives would have moved on. After a year of talking to swing voters in this swing district, however, I sensed tension within Tom. “Are you satisfied with Trump when it comes to basic decency?… Does he meet the standard of decency you set for yourself?” I asked. Tom said no. We talked. We listened. We swapped stories. We bonded over shared concerns, specifically as fathers of daughters. As we bonded, he opened and allowed that Donald Trump is a nasty bully encouraging extremism. Eventually, Tom went from saying he didn’t regret voting for Trump, to joking that he voted for Trump in jest thinking Trump couldn’t win, to finally, uncomfortably, admitting that he couldn’t look his teenage daughter in the face and say he was proud of his choice. Originally leaning Republican, he found himself agreeing with the need for checks and balances and leaning Democratic. The technique I was practicing in my 15-minute conversation with Tom is called “deep canvassing.” There is a growing body of work pointing to it as the way to engage swing voters and nonvoters, and move them in the progressive direction. 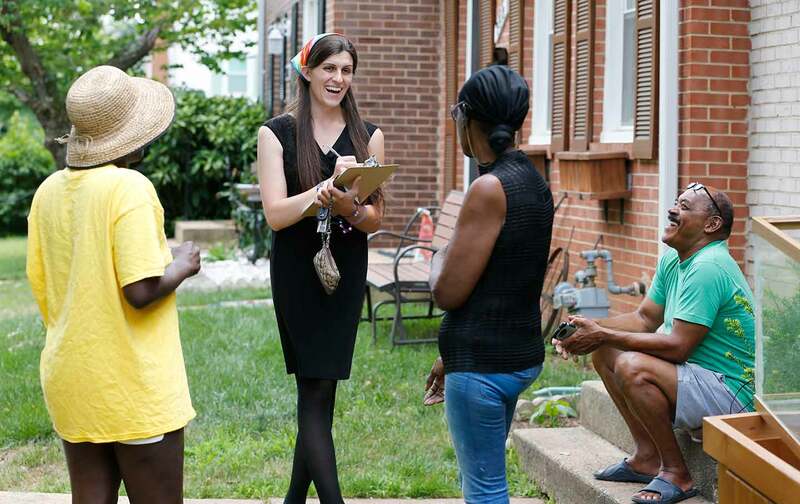 While most door-to-door canvassing focuses on speedy interactions with your base to increase turnout, deep canvassing is a more relational form of voter engagement which leads to respectful conversation. It is also the most effective form of voter persuasion ever measured. In 2017, I and my colleagues launched Changing the Conversation Together, and spent 13 months “deep canvassing” swing voters helping Democrats win one of the biggest upsets in the midterms. We trained volunteers in storytelling, empathetic listening, and engaged conversation to help voters connect their personal experience to politics. We spoke to nearly 1,900 voters, helping the Democrat win Staten Island by 1,100 votes. Despite the trend to vote Democratic, our post-election study showed that the voters we canvassed were 14 percent more likely to vote and 20 percent more likely to vote Democratic than their non-canvassed neighbors. In targeting voters traditionally neglected by Democratic campaigns, we exploded the myth that Trump voters are unmovable. While some fit that description, we also found Trump voters and nonvoters regretting their decisions. We met people with traditional leanings that hadn’t digested how the president emboldens hate groups and undermines a basic sense of decency. Many, upon reflection, were frightened by all the trends unleashed and agreed on the need to put these trends in check. Since November, our young organization’s success has led to inquiries from around the country. Activists, organizations, and campaigns from Florida, Ohio, Pennsylvania, North Carolina, and West Virginia have reached out for advice. Some traveled to New York to train with us. They, like us, want to do this work and want to do it now. Meanwhile, the presidential election is 20 months away. Unfortunately, while scientific studies consistently show high-quality, in-person conversations outperforming every other form of voter engagement, the Democratic nominee will likely raise over $500 million and spend it mostly on TV ads in the few months before the election. Before the nominee is chosen, millions of dollars will be targeted at Democratic primary voters, but most of this activity will not engage the swing voters who frequently decide the general election. The eventual nominee will likely hastily assemble a team in the last three or four months of the campaign focused on mobilizing the Democratic base. While the midterms showed the Democratic nominee may have a good chance to win, incumbent presidents often bounce back from midterm losses to win reelection. In this high-stakes environment, there is important work to do. Democrats, ask yourself this: With all that is at stake, are you going to wait until fall of 2020 to think about reaching swing voters who may decide the election? There are millions of volunteers who want to help—will they be offered the highest quality training to convert their energy into meaningful action? While Democrats have an important decision to make about who can best lead them, the danger of a continued Trump presidency is too dire to spend our limited resources on internal fights. We need to start training volunteers and talking to prospective voters about what’s at stake now. We are getting to work. We hope we’re not the only ones. Adam Barbanel-FriedAdam Barbanel-Fried is a professional organizer with over 18 years of experience organizing throughout the United States and abroad.